First and foremost, I would like to apologize for any inconvenience and stress resulting from the manner of communication provided by our Customer Service agents. As the fastest growing travel company in the world, we sometimes fall short of our goal, however we are constantly looking to improve. Please note that the reservation which you made on-line, has not been finalized. To complete the reservation process, you need to speak with a sales representative, to ensure that you are eligible for the promotional package, and then you must accept the Reservation Details governing the package via electronic signature. All credit card information is encrypted and cannot be accessed by anyone. All qualifications and restrictions, as well as any additional resort fees, taxes, and/or deposits which may be required by any particular resort are contained in the Terms and Conditions for each package. The Terms and Conditions are located at the bottom of every hotel/resort offering page on our website. The Terms and Conditions are reviewed with each guest during the sales call and must be agreed to, and accepted, by all guests before the reservation can be finalized and forwarded to the resort. 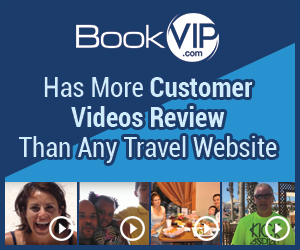 BookVIP has thousands of travelers every week, and has more video testimonials from happy customers than any other travel website in the world! I just want to say that I have tried to confirm my reservation four or five times just to be told they can't hear me despite the fact that I just got off the phone with my daughter I cannot seem to get them to stay on the phone with me they keep saying they cannot hear, you call back or they will tohang up.and one of the first ones was quite rude about it and I'm really getting frustrated at it since I gave you my card number and I don't know what's going to happen I have read on other sites where you cancel people's reservations causing them to pay for more and other various things and I am starting to get a little worried that this is a scam. Review #1012246 is a subjective opinion of Lisard.